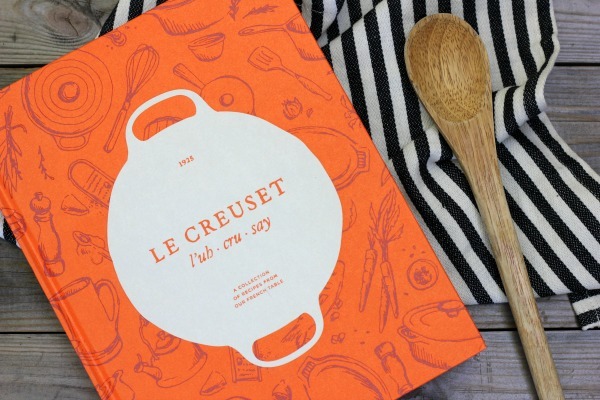 This post is in partnership with Le Creuset. As always, all opinions are my own. us over for dinner from time to time or we may have starved! wow this lady can do everything! how to cook! Thank goodness we no longer eat boxed macaroni and cheese for dinner! 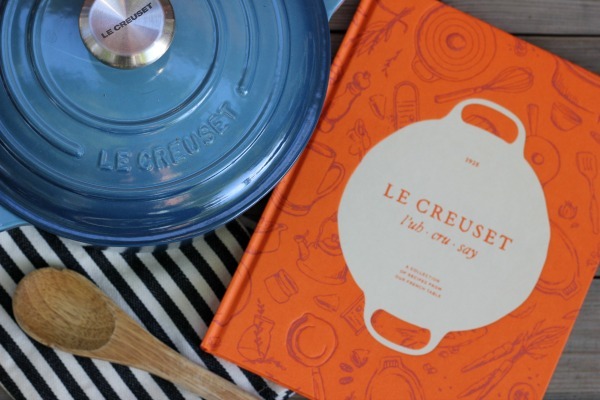 my favorite brand of cookware, was releasing a Le Creuset cookbook! 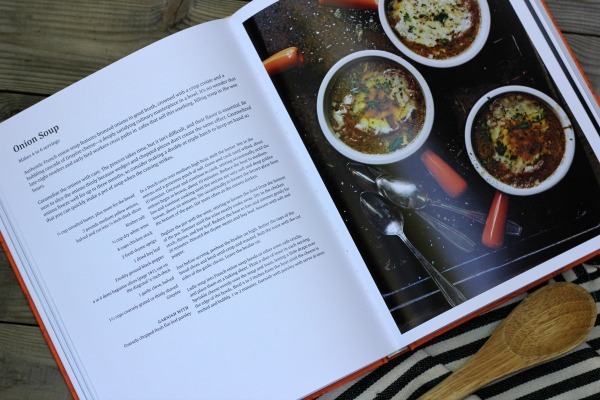 80 delicious recipes, such as salmon in puff pastry, brioche rolls and apple tart tatin. caramelized onions, french bread and Gruyère cheese! 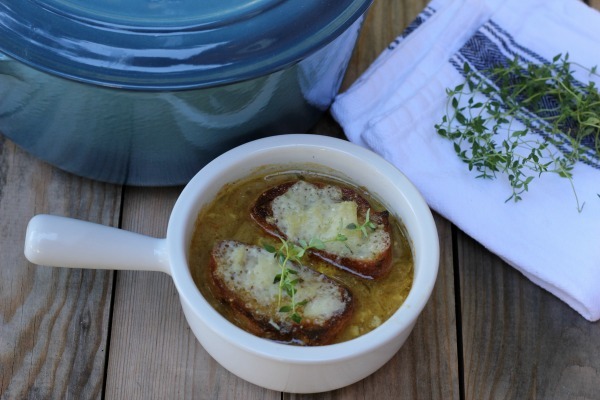 Whenever I make homemade soup, I always make it in a Le Creuset Dutch oven! Dutch oven in the color Marine. It is such a gorgeous color! soup all winter long! Caramelized onions are also delicious on pizza! oven just like the one I'm using in this post! and leave your Instagram handle in a separate comment. Contest ends October 30, 2017 at 12:00 pm EST. Good luck! generous pinch of salt. Cover and cook until wilted, about 10 minutes. cooking until the onions are very soft and deep golden brown, about 45 minutes. Stir occasionally to loosen the brown glaze from the bottom of the pan. Stir more often as the onions darken. the thyme stems and bay leaf. Season with salt and pepper. garlic cloves. Leave the broiler on. evenly over the soup and toast, letting a little drape over the edge of the bowls. minutes. Garnish with parsley and serve at once. 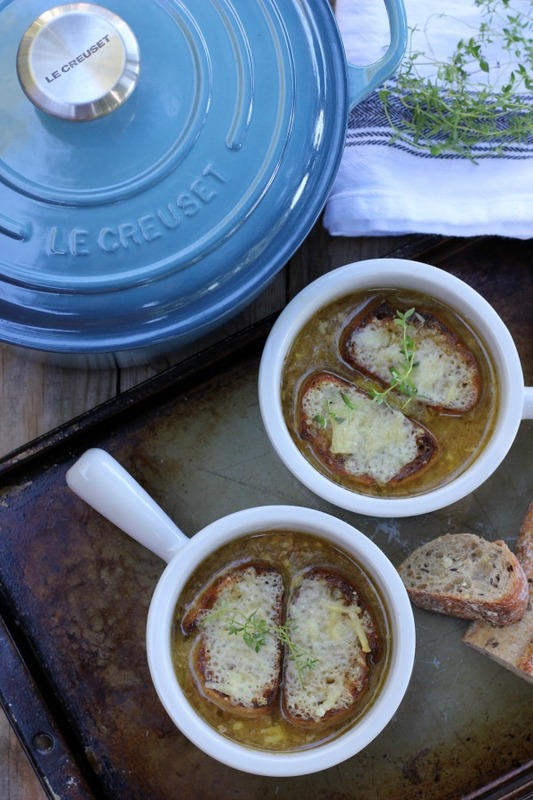 Recipe reprinted with permission from Le Creuset. Love any of the colors! But Marine or Mineral Blue are beautiful. My favorite color is Flame. Love how vibrant it is. I love the palm and the truffle! These pots are so versatile!!! I like Caribbean or marine and PINK!! 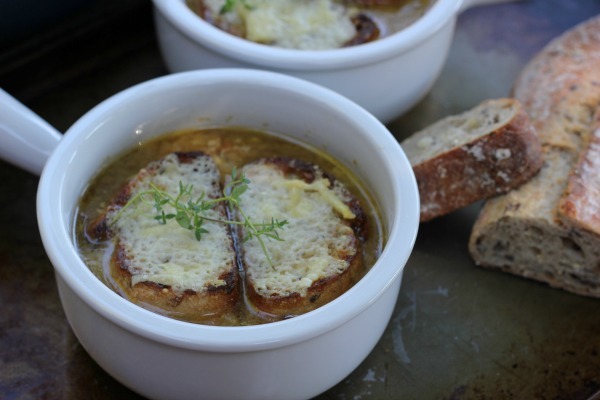 Been wanting to try making french onion soup so I'll have to try out this recipe! I like the Palm or Amethyst- oh so pretty!! Would love to try this Dutch oven out!! I love this Marine color you have. I've wanted one for ever! They used to have a teal color but not sure if they still do. My hubby bought me a knock off one years ago and it didn't last. Been wanting the real deal for a while. Soup looks yummy! Will have to try! Tammy! All of the colors are beautiful! I think the Caribbean is my favorite, but the Cerise is a close second! 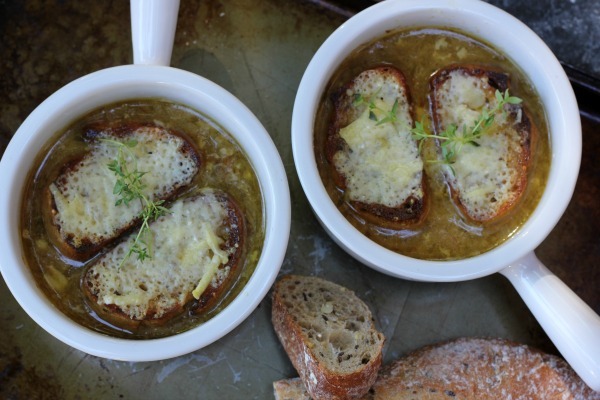 I'd love to try this French Onion Soup recipe! 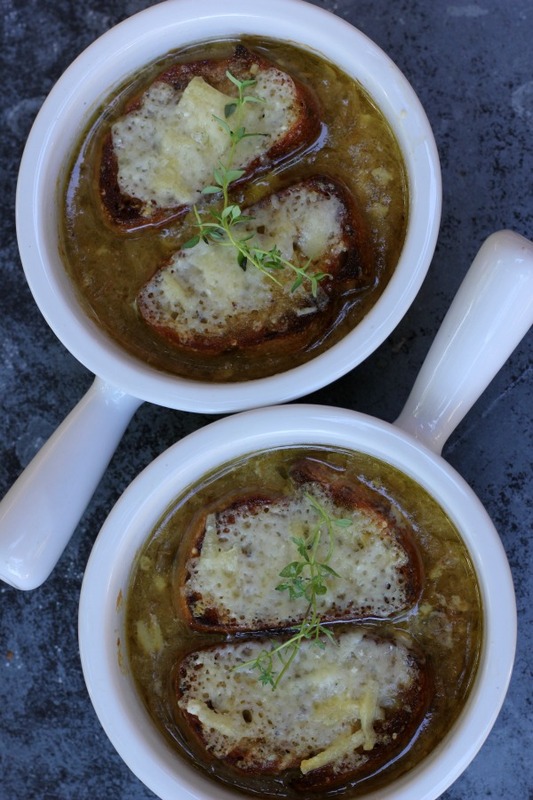 It is definitely one of my favorite soups, but I've never been brave enough to try making it at home. My favorite Le Creuset color would be Marine. Love the Cashmere color, and the similar Oyster color. Gorgeous cookware! I follow you on instagram @rusthawk1. I'm so in love with the Flame color. They have so many colors I love. It's a toss up between Oyster and Ocean. I love the marine as well! I have some pieces that I just adore! Especially my canister set. Best birthday present ever! I love them all, but anything in the blue family is the best! My favorite color is marine! But I love them all! My favorite color is white. A classic! All the colors are so pretty but if I have to choose one i will go with Hibiscus. Thanks for the chance to win! My favorite color is marine! But any le creuset color is perfect for me! I love the matte aqua! And I follow you on instagram! 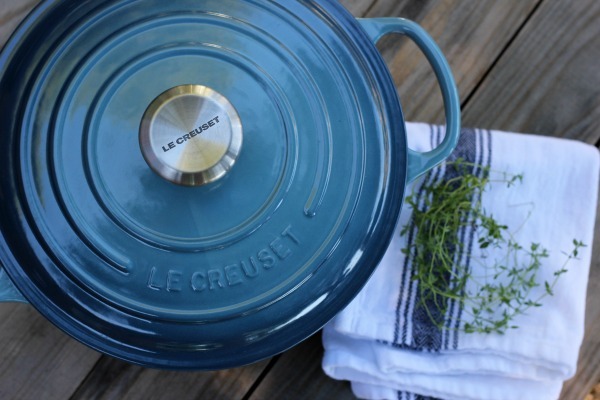 Mineral Blue -- but I love the whole Le Creuset rainbow! My favorite color is Flame. I follow on Instagram @ mysweetiepiepie.